We were up in the Berkshires last weekend visiting contemporary art mecca Mass MoCA and while we were there stopped in the museum’s “KidSpace” to check out an exhibit called “You Are What You Eat.” We didn’t stay long — the kids weren’t with us, we were away alone for the first time in three years — but we stayed long enough to catch a few works by Luisa Caldwell, a Brooklyn-based artist who turns fruit labels into these cool looking collages (like the one above). If I remember correctly, it was some sort of commentary on food marketing but the three concepts that swirled in my head for the days that followed — Stickers, Fruit, Kids — joined forces to form another idea altogether. For parents who are having trouble getting their kids to eat fruits and vegetables — how about using those labels for a new kind of star chart? 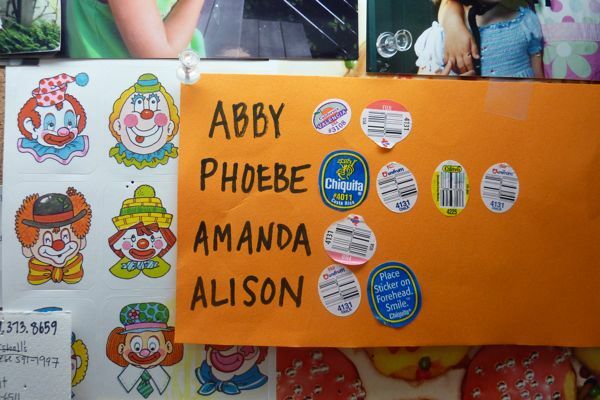 Every time they eat a piece of fruit, they get to add the label to their column. Once they hit a certain number, they get to pick out a book or a toy at the toy store. Or, for my Northeastern bretheren, they get to go to Mass MoCA! I faked this chart just to show you how I’d do it if my kids weren’t complete angels who need no incentive to down their five USDA-required daily servings of fruits and vegetables. And anyway there are no fruit labels in my house because everything we eat comes fresh from the farmer’s market or picked right from our backyard organic garden. The garden to the left of our Shetland pony stable and behind the servants’ quarters. PS: If you are headed to the Berkshires this summer, don’t go without first checking the area’s must-read website, Rural Intelligence. I used it to plan my entire weekend. It covers the goings-on in Berkshire, Columbia, Litchfield and Duchess counties. I like the spirit of the Chiquita one. Dole bananas have a sticker out these days that says “Lose Weight” (pegged to the is it two or three banana a day diet that was all the rage in Japan? essentially, you replace two meals with a banana and then have a healthy portion dinner). Anyway, my friend Blue recently posted on FB that his banana was tell him to lose weight, and his response was “Eff U, Banana.” That’s cleaned up for a family blog. I understand if the moderator has to step in. Fun idea! 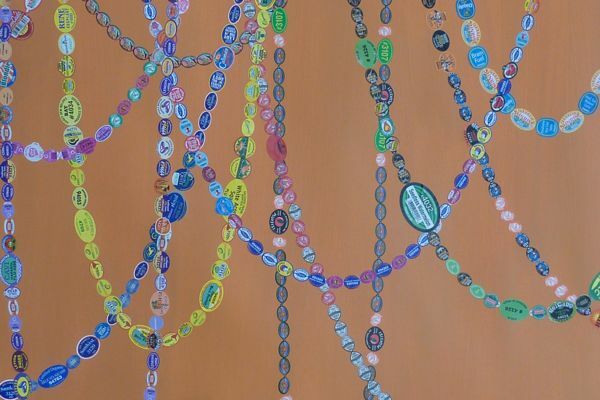 Those stickers chains are surprisingly beautiful. I love this! It reminds me of this poster I blogged about a few months ago. Same genius idea! Thanks for sharing the great inspiration. We especially love that their reward for eating more fruit is a trip to MASS MoCA!